When you want to cover up gray hair, you will typically be visiting the salon every four to six weeks. Regardless, roots can show up in as little as one week from the time of your salon visit. 4RootZ offers a root touch up option that allows you to extend the time in between salon visits longer than ever before. Most of the root covers out there come out dark, clumpy, or greasy. They don’t look great, fade quickly, and flake. If you weren’t ready for it to start raining, the moisture will melt away, leaving you to look like you were crying wearing mascara. 4RootZ hair coloring gel is here to save the day! 4RootZ is a natural looking gel that will leave your hair looking just like it would with any other hair styling gel. It can be used wet or dry, so there is no risk of a little water messing up your do. It will help you style away your gray until your next trip to the salon, saving you time as well as money. 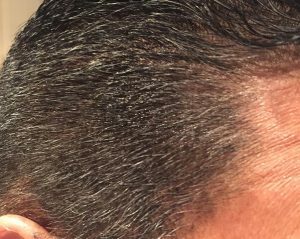 When does gray hair start? Some of us see grays starting to appear or take over as early as our mid-20s; sometimes even earlier. There are many commonly though reasons as to why this happens, but nothing in science has completely proven it one way or another. Stress, diet, and heredity are all thought to contribute to gray hair growing in. Our formula is unique among gray hair concealer products out there. It is a gel and can be used wet or dry. You can style your hair any way you are used to. You add a bit of 4RootZ to your fingertips and slide it through your hair the way you would with your favorite non-colored gel product. It comes in black, brown, and auburn. Our brown color can be applied very lightly to blend in with blonde or light brown hair. If you add a bit more, you can match a darker brown hair color. 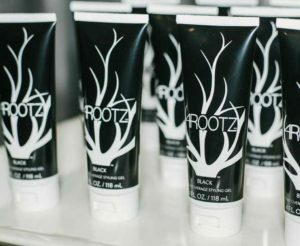 4RootZ hair coloring gel can be used on more than just a small section of the roots that are growing in. You can use it on your entire head of hair from root to tip. It can be used on facial hair to improve the appearance of thickness of a beard or other facial hair style. It can be used as needed. Even if you do not get salon color to cover up your grays, you can use 4RootZ for a one-day affair like an interview, date, reunition, or anything else you can imagine. If you just want to see how your hair will look before committing to a salon visit for permanent color, you can do that, too! 4RootZ works great for transitioning hair color. If you are in between your original color and gray, you can ease that awkward phase by covering it up. Nothing is needed to keep the gel in place on your head, but if you want to use additional products, you can. Styling products like hairspray are compatible with 4RootZ simultaneously.